The mound builders constructed ceremonial platforms and burial mounds. 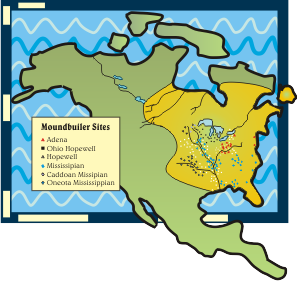 The Mound Builders is a term used to describe several First Nation's cultures that built earthen burial mounds and other earthworks across a large area of North America that extended from the Great Lakes to the Gulf of Mexico and from the Mississippi and Missouri Rivers to the Appalachian mountains. The Mound culture emerged at about 3000 BC and disappeared around 1200 AD. The term 'mound builders' doesn't refer to any one specific culture, but rather encompasses several cultures that spanned the 4000+ year period and ranged from mobile hunter-gatherers to sedentary farmers. The earliest mounds were built approximately 4000 years ago (The Archaic Period) at a place now known as Monroe, Louisiana. The site consists of eleven mounds. The Archaic mound-building tradition continued in that general region until approximately 500 BC. A site known as Poverty Point, in West Carroll Parish, Louisiana,includes two large mounds, one of which reaches 65 ft (20 m) high. Each of those mounds is surrounded by six concentric earth ridges. The Archaic culture morphed into the Early Woodlands culture but the mound builders traditions continued with the evolution of the Adena Mound Building culture (circa 1000BC - 300BC) and then the emergence of the magnificent Hopewell mound builders (circa 300BC - 700AD). Large, mainly dome-shaped mounds appeared throughout the Ohio and Tennessee river valleys, some in the form of animal effigies. In the Hopewell culture, centered in Southern Ohio and Illinois, earthen geometric enclosures defined areas ranging from 2.5 to 120 acres (1 to 50 hectares), and some mounds reached 65 ft (20 m) in height. Many served as burial mounds, sometimes for individuals and sometimes to hold the remains of a number of people. Others were temple mounds - earthenwork platforms supposedly used for religious ceremonies. Burial mounds were more common in the Archaic and Early Woodlands Periods and temple mounds were in the majority at some locations during the Mississippian period (after A.D. 1000). Eastern Woodland Indians is a term describes a polyglot of tribal societies that once inhabited an area in North America that extended from the northern coniferous tree line and the headwaters of the McKenzie River, through the vast hardwood forests surrounding the Great Lakes and the shores of the Mississippi River, south to the Gulf of Mexico and east through the Carolina forests to the Atlantic seaboard. At the time Europeans reached the shores of North America, the Ojibwa Indians were the largest tribe on the continent. They referred to themselves as Anishnabe - a word that means the people. There were many similarities between the Eastern Woodland Indians who lived below the Great Lakes and their cousins who lived in the rocky forests of the Laurentian Shield. Although the Eastern Woodlands Indians culture reached as far north as the headwaters of the McKenzie River in what is now Canada, it thrived particularly well in the forests and fertile soil along the Ohio River and south along the Mississippi to the Gulf of Mexico. The map shows the most southerly range of the Woodland way of life.